A spy uncovers some information that makes him question the integrity of his government and superiors in this thoughtful espionage thriller from writer and director David Hare. Johnny Worricker (Bill Nighy) is a veteran agent with the British security agency MI5, a man whose boss Benedict Baron (Michael Gambon) regards as a principled individual in a business of rogues. But Johnny's dedication and professionalism are put to the test when he becomes aware of top secret documents that connect the current prime minister (Ralph Finnes) with a conspiracy to extract classified information through illegal means. When a conveniently-timed murder suggests to Johnny that people are willing to kill to keep the report quiet, he's confronted with a new world of danger, and when he falls into a relationship with Nancy Pierpan (Rachel Weisz), a political activist in the publishing business, he's not certain if she can help or is making his life more dangerous. 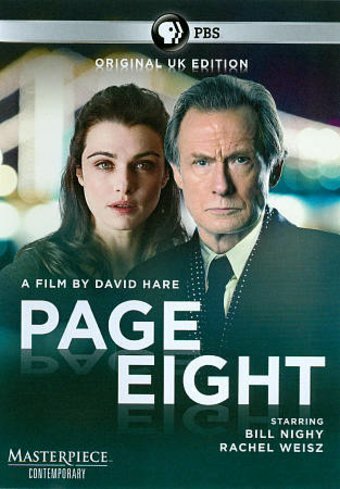 PAGE EIGHT was the closing night Gala Presentation at the 2011 Toronto International Film Festival.